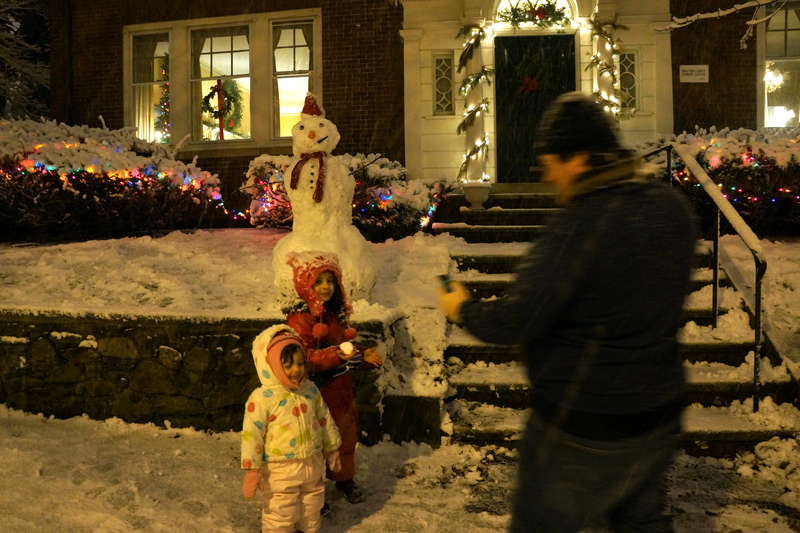 Making a snowman this winter at home in Providence. I recently received an email from a reader who, in researching a potential move to RI, stumbled upon my post A Year in Providence. Noticing that the post was a few years old and that we appear to still live in Providence, he wanted to know my “updated thoughts about the area.” So here they are for you, reader, and for those of you curious about making a move to the Ocean State. When I wrote A Year in Providence, I commented that it was the longest we had lived anywhere within the prior six years. In just one more year, it will become the place that I have lived the longest in my life. As scary as that sounds (even to me), I can honestly say that I feel at home here in this small city in the smallest state. That said, no place is perfect. So if you’re considering moving to Providence like I was a few years ago, I will provide you with my own now more-seasoned pro and con list. Cons: The public schools still largely fail to impress in Providence, which is why many people moving to RI who hope to use public schools opt for nearby towns like Barrington or East Greenwich. Sadly, people don’t move to Providence for the schools; they move here despite the schools. Pros: That said, I do have friends with children at Paul Cuffee Charter School and Vartan Gregorian Elementary who seem extremely happy. Also Nathan Bishop Middle School went through a stellar 35-million-dollar renovation, and no one doubts the reputation of Classical High School. Perhaps because of the apparent lack of quality public schools, Providence boasts some amazing private schools (Wheeler, Gordon, Moses Brown, Lincoln). Unlike some cities where money isn’t even enough (good timing and connections are also essential), in Providence’s private schools, there are often spaces available for newcomers. Keep in mind too that all of the private schools do offer financial aid — and you might be surprised to qualify for it since they check not just your income but your expenses. If paying over twenty grand per year for your child’s education is a deal-breaker, there are plenty of terrific lesser expensive local options–we have friends happy with the parochial Bay View Academy, Ocean State Montessori, and the Jewish Community Day School. I’ve also been impressed on recent visits to the French-American School of RI which packs in a lot of learning, language and cultural immersion for less than half of a typical private school tuition. Another option for K-5 is the Henry Barnard School, a laboratory school at Rhode Island College which offers private school education for one-third of the standard cost. However, this is one of the only schools here where I’ve seen an actual waitlist. As a side note, I’ve found no shortage of great daycare and preschool options in Providence. People who have lived in Manhattan know two things: you live in inches, and you live within a five block radius of your apartment. You live in inches because every square inch of your apartment is precious (which is why we’re storing one of my NYC friend’s grandfather’s photo projector in our Providence basement). And you live within a five block radius, because, for most everything, there’s no need to leave. Within that, you’ll find your post office, banks, bookstores, cafes, restaurants, yoga studios, gyms, playgrounds, etc. When we lived in Manhattan, Geoff and I would count the number of restaurants we could access by crossing only one street, which would quickly hit double digits. Because of this, Manhattan has a much more neighborhood feel than you might expect–the postal workers on Hudson Street still greeted me by name even years after I had moved out. Cons: Like Boston, in Providence most people who can afford it have a car. Although we can access several restaurants, a playground, two bookstores, several cafes, a post office, and an independent movie theater all within a few blocks of our house, we still drive most days. Even our pediatrician’s office is only a few blocks away (and yet in the winter, I find myself driving there). Pros: Although we don’t generally live in a five-block radius, I do think Providence in this area gains an advantage over surrounding suburbs and nearby cities like Boston: Providence maintains a friendly, small-town atmosphere with a diverse population and urban culture. Where else other than Providence will you regularly run into your Governor at your local coffee shop? Plus, if we made it a priority to walk more, we could. On the upside, we have succeeded in having only one car (and two Zipcar memberships). Cons: Unlike New York City, there probably is not something for everyone in Providence. In particular, I’ve heard single friends complain that it’s not as lively as other cities. Pros: Maybe it was because our apartment looked out over a pulsating Seventh Avenue, but when we lived in Manhattan, I used to feel guilty staying home on Saturday night. Now, with children ages five and two, we don’t have much time or energy for nightlife. Still, we enjoy great restaurants, theater and museums. We picked Providence because we believed it fit our lifestyle for this time in our lives–a place with some of the best aspects of a city (good food, shopping, arts) without some of the worst (traffic, crowds, cost). One of my friends who was down on Providence before we moved here admitted that we’d eat well. And she wasn’t joking — we have better restaurants (and food trucks) than many cities, and Providence often makes national top ten lists. We’ve got great farmers’ markets, farms, and craft/local art stores. We don’t have the Metropolitan Museum of Art, but the RISD Museum houses some impressive art (Van Gogh, Monet) in a museum you can actually get through with kids. We’ve got quality theater (Trinity Repertory, Providence Performing Arts Center). And of course, we benefit from the residual culture from Brown University, Rhode Island School of Design, the University of Rhode Island (which has a Downcity campus), Providence College, and Johnson and Wales University. And for those urges Providence can’t sate, Boston is under an hour away and New York City under three hours by train. In the last few months, we’ve taken the kids to Boston for the New England Aquarium and the Museum of Science; and last Memorial Day weekend, we took the kids to New York City for Central Park, Times Square and the Natural History Museum. Still, it’s nice to come home to Providence. Pros: In my opinion, Rhode Island has the best beaches in New England. Massachusetts beaches (yes, even the Cape) are too cold in my opinion. RI has low-key rocky beaches (Little Compton), protected soft surf beaches (Sand Hill Cove), and open ocean waves (Westerly). Add to that great parks, well-maintained playgrounds, and definitely the best zoo in New England. Plus, unlike other states, driving out to the rural country of Rhode Island takes only a few minutes. In a few miles outside Providence, you can access dozens of farms for berry and apple picking, and small towns for some local charm. Cons: RI has no mountains, so in-state skiing is restricted to the modest Yawgoo Valley. Still, it’s not a far drive to Vermont or New Hampshire. Cons: Unfortunately for us, real estate has not been a great investment in Rhode Island in the last few years (see WPRI story). Every few months either Geoff or I get a serious bout of malaise at having given up our NYC West Village apartment for our house in Providence. I think it’s time to admit that Geoff was right when he said, “we are condo owners”–we don’t really like painting rooms, refurbishing bathrooms, or dealing with plumbing issues on a hundred-year-old house. Pros: On the upside, this may be a great time to buy in Providence. And right now, you certainly can get a lot more house for your money here than Boston, for example. For us, Providence offered a house where we can walk to the city (and train) but still have a yard, driveway and plenty of room for home offices and guests. Cons: Job options need to improve here. We have a bit of a catch-22 on our hands here in RI: people can’t live here without jobs, and since people can’t get jobs here, they don’t move here. The jobs and the people come and go together, in other words. RI has trailed the nation with one of the worst unemployment rates (see USA Today story). And we really need to stop placing high on lists like our recent second place in “worst state to do business” (see Providence Business News story). Furthermore, corruption still exists here clearly. If the botched 38 Studios deal doesn’t make that strikingly obvious, nothing does. Similarly, RI was doing great with attracting Hollywood film, but they cut the film tax credits which left the state dry compared with neighboring Massachusetts where film is thriving. You forgot that Providence has easy access to the best bike path that I have ever been on, no exceptions! I agree with everything you said! We moved here from Texas about a year and a half ago and I don’t regret it one bit. Really well thought-out answers. I like the public transit, especially around the city proper. When our car was stolen in August, it was a relatively painless transition to RIPTA. We’ve been here 4-1/2 years and definitely find the pros outweigh the cons. Providence is also the host of many prominent colleges. Brown University, Providence College, Rhode Island College, Johnson & Wales University, and an extension of University of RI are all within the city limits. Michele thank you for your great overview of Providence. My wife and I will be relocating to Providence, by way of Dallas, TX, in August and are curious as to where to live. We have a two year old son so safety is of high prioity. Thanks for your input. Why is Providence or RI such an unfriendly business environment? I would assume taxes and red tape. My wife and I are going to visit Providence in early October. How is the winter and is it humid during the summer. I really appreciated your insights on Providence, and reading of your background. I’m contemplating a move to Providence in autumn. Washington DC, Manhattan and Baltimore have been my stomping grounds over the last 15 years and I’m ready for something a bit different. I’m a healing arts practitioner (craniosacral therapy, myofascial release, trauma resolution, energy work, prenatal/postnatal massage, eastern techniques, etc), and I’m wondering if you can speak to the potential to grow my practice there? Also, are you teaching in a community setting at all? I’m keen to re-ignite the writing fires. I’m interested in deeming my writing skills and exploring documentary film-making. I can’t speak specifically to the potential of your practice — sounds interesting though. Right now I’m teaching at URI in Kingston, but I’ve also taught at Frequency Providence which is a great local adult education organization for writers. I’m planning to move to Providence after living in San Francisco for a number of years and more recently Buenos Aires. My concern with the East Side is the college kids…are there areas of the East side where you can feel that you aren’t on a campus? You mentioned that you’ve got friends on the West Side. What would you say the primary differences between the two are? I recommend taking a look at the Providence site that describes different communities at http://www.providenceri.com/ONS/neighborhoods. It’s difficult to characterize the West Side or the East Side because each contains its own neighborhoods, but I’ll give you a rough sketch. The East Side contains College Hill (near Brown University & RISD), Benefit Street and Blackstone Blvd areas in which houses can run as much as 700k to over a million. But on the East Side, there are also some wonderful more affordable neighborhoods near Wayland Square or the Hope Street/Rochambeau stores. The West Side has been the site of a lot of economic development in the past few years and contains diverse enclaves, as well as Providence College and Rhode Island College. The West Side contains Federal Hill (historically an Italian neighborhood), Olneyville, Smith Hill, Mount Pleasant neighborhoods and others. I actually never considered which exact neighborhood friends of mine live in but from looking now, I think mostly in the Mount Pleasant, Federal Hill and Smith Hill areas. I’d recommend checking out http://provplan.org/ for future development plans for neighborhoods too. Very helpful, Michelle. Thanks! Google street view is great as well to get a visual idea of the different areas…. I didn’t see a lot of mention about medical facilities in Providence, so I’d like to add that we have excellent hospitals (RI Hospital, Jane Brown, Roger Williams, Miriam, Hasbro Children’s and more) and excellent doctors and medical professionals. There are also many very good nursing and long-term care facilities in or near Providence. Thank you for this! My husband and I are currently searching for that “place to call home” and would like to escape tha pace of NYC. Love the walkable town we live in in Westchester but SO expensive and I still deal with the crazy of NYC every day at work. We’re going to Providence to tour soon. Any neighborhoods you can suggest for raising a little girl (1) and having a great community, walkable feel? We can’t wait to be homeowners. Thanks! We have many New Yorker friends who moved to Providence! For walkable, nice community, etc. check out the East Side of Providence — especially College Hill (Brown, Prospect Street area) and Wayland Square area. Both of those have great shops, restaurants, etc to walk to plus playgrounds. If you want to be walking distance to downtown & the train, then College Hill is ideal. You might also like the Hope Street area near the shops (the area between Lippitt Memorial Park and Rochambeau). There’s also great neighborhoods on the West Side, but I’m just not as familiar with them. Report back on what your thoughts are! Thank you for your post. I plan to move from Mass to Providence. I m asking about which part of Providence is safer to live in. Thanks. I honestly don’t know about *all* the different neighborhoods of Providence. We live on the East Side, which I consider quite safe. We also have friends who live downtown or on the West Side (near Seven Stars/Grange/Nicks on Broadway), which is a nice area too. I also really like the Mount Pleasant area (near Rhode Island College). Thank you very much for all of this information. I am considering moving to RI from Orange County, California. This information has been really useful in helping me decide if I want to make that move which I think I do. Michele, Thank you for this post. My husband and I are looking to move to RI in the next year and I have looked at many websites for information, many leaving me very discouraged. It was nice to see a clearly thought out article. My apprehensions may still be high, but this certainly lets me feel that we will find a place to call home. Hi- We are seriously considering a move from Philadelphia to either Providence or Barrington. We’ve lived in center city Philadelphia for over 17 years and are slightly apprehensive about leaving the our urban lifestyle. Our children (ages 5 & 7) are currently enrolled in private school in Philadelphia (our schools are terrible), so are leaning toward Barrington in an effort to avoid private school, but worry about being happy in a suburban setting. Thoughts or experiences on this front? Yes, it is true that the schools in Barrington are better than the average Providence public school. That said, I have numerous friends who have been very happy with elementary schools like Paul Cuffee (charter), International Charter School (another charter) and Vartan-Gregorian (public). I also have numerous friends with middle schoolers at Nathan Bishop (public) who attest to it, and Classical High School (application based) is excellent. So you *can* manage to do public school in Providence. There’s also Henry Barnard School which is a laboratory school through 5th grade for a third of the cost of typical private school tuition. As for the other part of your question, I’m not a suburbs person. Geoff & I tried that for a few years and we hated it. So I guess I’m willing to make the sacrifices necessary to be in a city… That said, there are plenty of people who make the switch from city to suburb happily so it’s really a personal choice. Can you come visit during the school year so you can see some of the schools if that’s your concern? Much thanks for this informative post! We are in the DC area, but will be relocating to RI in the next month..I have only visited twice, and it is so different from what we are used to here….Your post has given me hope that our new life is something to embrace and look forward to! Thanks for that! Loved reading your post. Great information. We are a family of four (10 year old daughter and 11 year old son….6 th n 7th grade) looking to move to this beautiful state. Is there a particular family friendly community that you would recommend? I will definitely start looking into the private schools that you mentioned. Families live in all areas of Providence – so I suppose they are all in some ways family friendly! If you’re looking into private schools, both Moses Brown and Wheeler are located in the East Side of Providence near College Hill (and Brown University), which is one of the more affluent neighborhoods. I hope that helps! Michele, this post has relieved me of so much anxiety, thank you for your review and recommendations! Being totally unfamiliar with Providence, I’m wondering if you can provide any suggestions for me. As a mature student, I am looking to move there early next year (from outside the US) to attend JWU with my 11 yr old (grade 5) son in tow. I see you’ve made made some recommendations for families however; for safety purposes do you have preferences more specific to us since we’re a smaller family ;). Ps. Just FYI, English is first and only language so not a concern. Hi – I’m so glad to hear that! Feel free to email me at mm@michelemeek.com if you want to talk more privately. But what type of suggestions are you asking about — schools or neighborhoods? Thank you for your blog. This has provided my husband and I with some realistic views from someone who has lived in other areas of the country. We are contemplating move to RI from southern Indiana and we are very apprehensive due to the cost of living and job market. I will admit the job market is not impressive in RI – hopefully with a new mayor and governor this year, we’ll see some change in that. In the meantime, there are plenty of people who commute to Bosotn (which is 35-50 minutes on the train). I just returned from a holiday trip to RI to see my family. I’m thinking of a transition back (20 years since I left!) this article was really serendipitous to find tonight. Really hit all points! Thank you! Hi Michele-what a breath of fresh air to come across your blog! I’m heading up to RI to interview for a great job in the insurance industry and with grown children, schools are not the concern anymore. We’re an African American professional couple and I know coming from New York there’s really no comparison in terms of diversity but in your opinion and from what you’ve observed do you feel that RI is tolerant and open minded? I do see more and more comments from people moving from other states which is welcoming but I don’t see many comments from people of color which is not surprising since there’s not a large percentage of people of color in RI. I think this may be a great opportunity and of course I’m completely open and I see some wonderful areas to consider moving to if this comes to fruition but just have to ask that all important question (unfortunately). We’d potentially like to live in the Providence area but are certainly open to other options that are safe, quiet, and close to work (a few miles from Providence). Thoughts? Observances? Thanks! Certainly the circles that I find myself in are fairly progressive. Many of my friends are academics, doctors, tech/media professionals, and nearly everyone is quite liberal and open-minded. Still, I have to admit too, sadly, that the population of the East Side where I live seems to be largely white. One friend of mine told me once how she had prepared her daughter to get used to being the only black person in the room. I’ve thought about this over the years. In actuality, I don’t think it’s much different than neighborhoods where I’ve lived in Boston and New York. NYC seems diverse, but have you seen this article? http://www.forbes.com/sites/trulia/2012/11/13/finding-diversity-in-america/ It says how the West Village, where we lived in NYC, is 83% white, for example. So there are much deeper country-wide problems when the facts in this article demonstrate that “Expensive neighborhoods aren’t very diverse”. So, I guess my answer to the question is that you won’t find tremendous diversity in the more affluent neighborhoods in Providence, any more than you would in any affluent area of the country unfortunately. But I would certainly expect that my friends and neighborhors were open and eager to see that change (I know I would be). Thanks for Sharing the article as well as providing your thoughts. Essentually economics is a major driver now moreso than any other reason. I’m actually in Providence now for a short time so I’ll have the opportunity to checkout some of the various neighborhoods you mention in the blog and regardless of whether there is diversity or not, I hope we’re fortunate enough to live near people like you. Also following you on Twitter. Appreciate your insights! Glad you found it helpful – who knows, our paths may cross at some point. Providence sometimes feels more like a small town than a city! And feel free to post updated thoughts – I’d love to hear your experiences/impressions. Accepted the gig and looking for a place in the Providence area now. Going to really do the deep dive in terms of living in the city or surrounding suburbs and your insights are most appreciated! I’ll keep you apprised. Wow this is just what I needed! Thanks for the blog and the insights! I have been preparing to move to providence for a job relocation with my company. I have never lived in the north before. I have loved in Florida for 10 years and 10 years now in Atlanta. This will definitely be different for me. My plan is to get to providence and stay in hotel for a few days and while at the same time make a decision of where to rent . I am a single 35 yo male who is part of LGBT community. Would you have any recommendations for me as far as what areas of town may be a good fit to suit my lifestyle? And by lifestyle I mean single male who is quiet and enjoys reading, writing, going to the theaters, and sometimes a weekend outing for drinks with friends. I’ll be working in Lincoln. :)) thank you!! Glad to hear it! We currently live on the East Side, but I really like the West Side which feels more cutting edge in many ways with some great new restaurants. I have heard that living downtown or ‘downcity’ as its called is also more fun as a single person. I hope this helps! Feel free to email me at mm@michelemeek.com if you have questions I can answer too! Our family moved to the East Side in August 2014. We came from my hometown of Medford NJ and I do remember reading your blog as I tried to decide on Barrington or Providence. Thanks for the putting it out there – it was very helpful. We could not be more thrilled to be on the East Side – our kids are 13 and 15 and love the independence of walking to the shops and restaurants that surround us. They also love that they can ride their bikes and take advantage of the Brown athletic facilities( amazing olympic size pool, extensive turf fields, basketball and tennis courts). Our kids go to LaSalle Academy and have settled right in to this fantastic catholic co-ed school. Great teachers, sports, drama and every kind of club you could imagine. Even our golden doodle loves Providence! So many great places to walk and one of the best dog parks we’ve been to is right down the street from us. The shops at Wayland Square are so dog friendly! The book store hands out biscuits to our furry friend! That’s so great to hear! Thanks for checking in and posting! So often I hear from people while pondering the move, but not so many after to see how it turned out. But I’m glad to hear that – and I’m sure others will appreciate your comments too. thank you so much for putting this together. It was really well thought out and the fact that you moved from a NYC meant you’ve dealt with a lot of the same things that my wife and I are working through as we ponder a move from downtown Chicago to Providence. This post was really helpful for us! Hi Michele – My wife and I are contemplating a move from Boston to Providence. We’ve been car-free for about 9 years in Boston, using Zip car. Do you have any opinion on the feasibility of being car-free in Providence? The public transportation in Boston isn’t *great* (which is why I always had a car there too), but in Providence, it’s obviously even tougher – there are busses (no subways/Ts). Still, between Zipcar and Uber – being car-free in Providence (assuming you pick a place to live near a Zipcar location) is quite feasible. Where I live there are about half a dozen Zipcar locations within walking distance. We have been able to get away with one car, but to be honest it’d be hard to get by without any car. Especially with kids, it seems there is often an extracurricular activity or birthday party or playdate or whatever that they need to be taken to. Plus I go back and forth regularly to URI – and driving is just much faster. I certainly have single friends though who have gotten by without a car, so it’s done frequently. Anyway, I hope you report back on what you decide! I’m moving to Newport in a couple of weeks and would love to meet new people as I won’t know anyone! I’ve lived in San Francisco and more recently Buenos Aires. I’d love to find a Spanish speaking group if you, or anyone reading, knows of one. I also have a dog, so any suggestions about dog parks or people with dogs who like to get together would be great. Thx! I list some of the dog parks in RI at https://therhodelesstraveled.com/2009/09/10/off-leash-dog-parks-in-rhode-island/ – not sure I got them all though. I wonder if you can find a Spanish-speaking group on Meetup? Good luck! Thank you! Yes, I was thinking of Meetup. There is a Spanish group in Providence…. Thank you for writing this. I’m going to follow your blog. We are a couple from New York who are considering retiring to either Providence or Newport because we like sailing, art, golf, and the ocean. It’s hard to find a place with all four and reasonable condo prices. (They are reasonable if you are comparing them to NY or CA, where I grew up.) Providence actually has lofts available (always wanted one as an artist) while Newport means we can stay involved in sailing events. Like others, I have lived in NYC and the burbs, and don’t want to live somewhere without nice food, diversity, and culture. Keep up the good work, I want to hear more! Hello, love reading your blog. My daughter is applying to Brown and I’ve heard some stories about crime in the city, as far as assault . Can you speak to this topic? April – Thanks for your question. In College Hill (where Brown is located), the main crime is typically robbery. These are usually situations where the person/people break into the house when no one is home. I know that in our house, even, there was an attempted break-in, but since someone was actually home (I think they didn’t realize that since there was no car in the driveway), the person/people ran off when they saw lights/heard someone. In the past year, there have been quite a few cases of these (although some people were caught this summer – http://www.providencejournal.com/article/20150831/NEWS/150839870) and I haven’t heard of any recently. There have also been a few cases of ‘armed robbery’ on the streets at night in the area, but these are infrequent. I have not known this to happen to anyone living here, but I do see the reports come through. Overall, the neighborhood is quite safe – much safer than most cities. I have *never* felt unsafe here – even if I’m out at night. Students here are likely advised to take the same precautions anyone living in a city, and I know the Brown students who have worked with us often use the ‘OnCall’ service at night so they don’t have to walk at night. See https://www.brown.edu/about/administration/transportation/brown-university-shuttle/brown-oncall-program for info. I certainly wouldn’t give up a chance to go to Brown because of safety! It’s as safe as any college campus, frankly! Hi Considering a job offer which is in the Boston area. I am currently living in SF area. We are looking for great schools, safety as we have two young children 5 and 2. We are city people and have lived in Brooklyn, Rotterdam, Vienna and now SF. Diversity, plenty of activities for children, restaurants, museums walking distance would be nice. I absolutely love your blog and really appreciate all the really thorough information and candid experiences you share! My family and I are moving to the area in June/July as the hubs got a job at Brown and I’m so nervous about this transition. We’re coming from Colorado, have a 7 year old and a 1 1/2 year old, and just really want to start making friends and really becoming part of the RI community. We’re considering living in either on the east side of Providence, Edgewood area, Barrington or East Greenwich (the two suburban areas are on the potential list due to the reputation of the excellence of the public schools) and are thinking it might be helpful to see what the communities are like in these areas by joining these groups. Also, any other words of advice as we make the trek to RI to a nervous but very excited family? on April 1, 2016 at 2:46 pm | Reply Dan D.
Here’s hoping! I lived in RI some years ago for college and am hoping to return someday soon. Providence really is a cool little city. Hello! We are contemplating a move to the East Side of Providence. Having a hard time deciding between a couple of houses – walking to Hope St. shops or Wayland St. shops. How would you describe the difference in those areas? Is one area safer than another? Thanks! Hi.Firstly, thank you for the well written article. We will be moving to Providence in October and I am looking at the housing options. I have a 5 year old kid so good schools is a major concern. I found that Providence city public schools are probably not that great but some neighborhood areas like Lincoln,North Providence might have good ones. What are your views on this and could you suggest some more such neighborhoods. I will be working at Brown University and am open to drive to work for 20-25 min if the residential area is safe and has good schools. Thanks! Hi Michele! Firstly, thank you for the well written article. We will be moving to Providence in October and I am looking at the housing options. I have a 5 year old kid so good schools is a major concern. I found that Providence city public schools are probably not that great but some neighborhood areas like Lincoln,North Providence might have good ones. What are your views on this and could you suggest some more such neighborhoods. I will be working at Brown University and am open to drive to work for 20-25 min if the residential area is safe and has good schools. Thanks! Hi – well, I’m glad you found the blog and that it was helpful! Quite a few of our friends have moved to Barrington, RI for the public schools. It’s also a lovely part of the state. It’s on the water and the East Bay Bike Path. So that would be my personal recommendation. Rhode Island Monthly does a ‘best public school’s article every year. They may have the more recent one on their site, but take a look at https://www.rimonthly.com/Rhode-Island-Monthly/September-2014/Chart.pdf As you’ll see Classical High School, in Providence, ranks as the second best in the state according to them. I do want to say as someone who cares *very* much about education (I’m defending my dissertation next month), I truly think that Providence can work if you’re willing to supplement school with some extracurricular programs. So it depends on what your definition of a “good” school is. For me, I’ve realized school is not only for academic preparedness, but for social experience–and I prefer a school with more diversity for that reason. I’m also more about “preparing the child for the road” as opposed to “preparing the road for the child.” I’m willing to supplement school with other programs to make sure the academics meet my standards. Anyway, it’s such a personal decision with a lot of factors to consider. Let me know if you have other questions! hi, would you plz tell me how is the job market for the new immigrants? I & my partner are lesbians who will come to the USA as a refugee. my English is good, we both understand English very well. when I say job market I mean anything that gives us enough income to live in the city and don’t die. I have a bachelor in microbiology but I don’t think I have a chance in that area since I don’t have experience. You might want to reach out to Dorcas – http://www.diiri.org/ – they have some great resources. Hi, Michele. My husband, 2.5 year old, and I are considering a move from Brooklyn (13-20 years between us) back to New England. My husband is from Providence, and I from CT. We like the vibrancy and diversity Providence offers. I am a public school teacher with the NYC DOE and really value a social justice vision when it comes to education, paired with academic rigor. We looked into Brown Play School for him as well as Ocean State Montessori. I’m more worried about myself, honestly, as my husband is a director and would be traveling on location for work, and you seem like minded in many ways. Is it easy to meet people with these views? Is there community activism around social justice issues? Are you aware of educator groups or schools that may fall in like with this? Any input would be helpful. I’m sorry I didn’t see your comment earlier. Yes, you would absolutely find like-minded people! Did you make a decision – both of those schools I’ve heard great things about as well. Especially since the election, there have been a number of grassroots/activist/community groups that have formed that are quite robust. Feel free to email me. Michelle, just stumbled on your blog as I am researching our middle school choices for my 5th grader: Nathan Bishop and Community Prep. My daughter has attended our local elementary public, RF Kennedy (Elmhurst is a lovely, if quiet, affordable area in Prov). She’s had great teachers and is doing well academically and socially, but the curriculum has been pretty rote and uninspiring- and there is a punitive attitude among some staff. Mixed bag. My daughter got into the Advanced Academic program at Greene which is closer to us, but she wasn’t keen on Greene. She’s looking for a positive school atmosphere (and challenging academics, nice kids, and opportunities to follow her interests in science, math, and politics…). I’m curious since the years you wrote about Nathan Bishop whether you can offer any further impressions to help us make this decision? And your blog is great! Hi Jess – I somehow missed your comment before. We have several friends whose children attending Nathan Bishop. The educational experience is mixed. Some of them have addressed this by doing a lot of academic supplementing (like with Squared School for math, for instance). There are definitely students like them who are there and love to learn. But there also seem to be a lot of behavioral issues (according to the students) that keep learning from being effective in some classes. You should visit the school and talk to students and parents (reach out to the parent organization)! Two of my adult children and I (I am 65) are looking at different states to move to from Texas (Ft. Worth area). My son is really interested in Providence. We don’t really have winter weather down here much, so was curious about that, and if the job market has improved since this comment thread began. I will say that our current governor has done a lot to try to draw business to Rhode Island, and I think she’s doing a good job. But I will say that most of our friends at least one person in the couple works in Massachusetts… That said, Boston is commuting distance. Thanks a lot for sharing your experience and vision, so nice to hear from someone that have been living in the city for a while…! I commuted to URI for 6 years, and I loved it there. Because I was a grad student and instructor, I was only going in about 2-4 times per week typically. In my opinion, the commute is totally doable from Providence (about 35 minutes and rarely traffic). This Fall, I’ll be commuting to Bridgewater, Massachusetts (about 40 min) where I’m starting as an assistant professor. As for safety, I have never felt unsafe in Rhode Island or Providence. I will say that Barrington, RI might be a good fit for you coming from San Diego, although that might make your commute farther. There are a lot of people there who have moved from Providence for the schools, and it’s a bit more suburban but also just beautiful over the ocean with a coastal bike path running through it. Another option is East Greenwich, although I don’t like it as much personally as Barrington. BTW if for fitting in you are thinking of political persuasions, you might want to check out this recent election map the Providence Journal posted, which shows which areas voted “red” or “blue.” As for the weather, I hate winter. I like ice skating, but I truly can’t think of any other redeeming features. But the kids love it!